Certainly the potential for “supplies drying up” (real or cultural) is a more and more a global fear, yet Canada has the added anxiety of having one's frozen corpse found in an ugly snowmobile suit once those supplies are gone--something our Jazz antecedents didn't have to worry about in New Orleans. While Harold Bloom posited the existence of an anxiety of influence, it could also be that anxiety IS the influence and the profound steering agent in the arts. 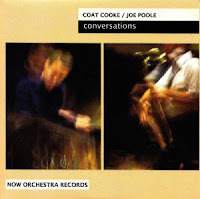 The anxieties I hear navigated on Conversations by Coat Cooke and Joe Poole are distinctly Canadian. The need to demonstrate, without a shadow of a doubt, a command of “composition” and an awareness of trends from that frightening, thawed landscape to the south, combined with the need to manifest that politely, fairly, judiciously, as representatives of a larger, (usually government funded) national arts expression is as Canadian as Mersyndol. To those ends, Cooke and Poole have executed their duty as Canadians. Conversations is a fantastic addition to the Now Orchestra's merch table, and of it Arts Canada should be proud. If your only exposure to any form of media is that which has been approved by the CBC, Conversations, with it's moderate, managed, little bit of everything/not to tart, not to sweet approach to the saxophone/drum duo is sure to blow the cheese curds off your poutine. 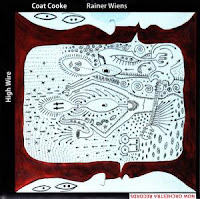 Those of you who might get more than one station on your receiver, or have been other places where “This Music” is practiced, Cook and Rainer Wiens' High Wire will likely capture that much more of your attention as it is that much less “Canadian” in its proportions than Conversations. Wiens' guitar coaxes from Cook what Poole's drumming did not without resorting to the kind of excitement that prevents the dishes from being washed or floors from being swept. This is what I don't get about Canada. Across the street from my house, one lone junkie steals childrens' bicycles and sells crack with impunity, depressing property values, stunting home sales, and driving our favorite life long resident of the neighborhood to abandon his home. When presented with this, the local dispatch of the RCMP offered excuses like “He's memorized what all the police cars look like, so there's nothing we can do” and “Sometimes he puts the crack in his mouth, so there's nothing we can do” and my personal favorite “His lawyer told us to stop harassing him, so there's nothing we can do.” Meanwhile, the RCMP have no problem tasing Robert Dziekanski to death at Vancouver airport for the crime of being Polish and looking confused. Canada, this is all to say I know you got it in you—so why not put it to good use? Clearly Cooke can play the horn, just as Poole can play the drums and Wiens can play the guitar. Their job now is to convince the CBC, Arts Canada and the rest of the parent culture they can't. Everyone on the production side of the arts knows (if only instinctively) Bloom-via-Milton's truth “to be judicious is to be weak and to compare, exactly and fairly, is to be not elect.” C'mon guys, drop gloves and giver already, eh?